LAKE FOREST, Ill. -- The Bears have signed former Chiefs kicker Cairo Santos and released veteran kicker Connor Barth. Barth missed a last-second, game-tying 46-yard field goal attempt in Chicago's 27-24 loss to Detroit on Sunday. "It just wasn't yesterday's kick," Bears coach John Fox said Monday. "We haven't been in the red area a lot. It feels a little harder than normal. Before yesterday, he was like, I don't know, we were down there maybe 16 times, so those four misses, five yesterday, you feel it. He sensed it, and he understands. It's never easy making those changes." 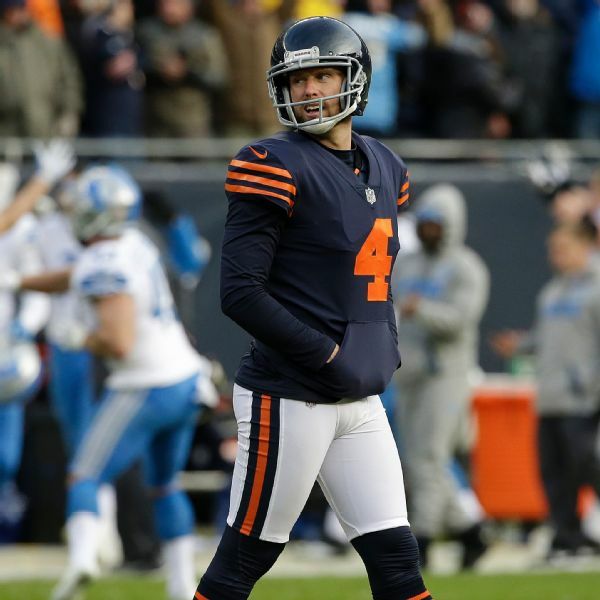 Barth, whom the Bears signed at the start of last season to replace Chicago's all-time leading scorer,Robbie Gould, made 18 of 23 field goal attempts during his first year in Chicago. However, Barth is just 11-of-16 in 2017. He has missed kicks in three of the Bears' past four games. "We are a production-based business," Fox said after the loss Sunday. "That's what we get paid to do, whether it's winning games as a head coach or whether it's making kicks as a kicker. We will evaluate it. Like I said, every time we go out there, we will do everything we can to put the best team we can out there." Santos, 26, was waived injured by the Chiefs on Sept. 30 because of a groin injury. "I'm familiar with him because of four years when I was in Denver, he was at Kansas City," Fox said. "I think the reason he was available was due to injury. Getting him healthy from that, I think, was key for him and us. We were fortunate that he was available. That's why we signed him." Prior to getting hurt, Santos was 3-of-3 on field goal attempts and 12-of-12 on extra points through the first three weeks of the regular season. "He's been pretty accurate," Fox said. "He gets pretty good lift on the ball. His leg strength he's developed, he has good hang time on his kickoffs. I'd say the key is he's an accomplished kicker in the National Football League." The Brazilian-born kicker converted a career-high 88.6 percent (31-of-35) of his field goals for Kansas City last year.